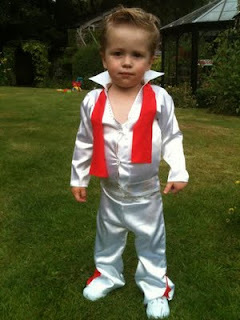 A birthday present and a fancy dress outfit - handmade! 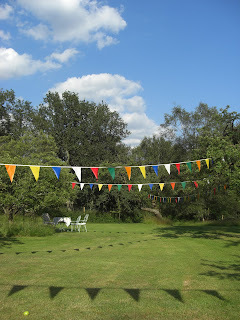 This weekend saw the brilliant birthday party of a very special little girl. Happy 3rd Birthday E! The sun was shining and we all had a fabulous time. I decided to make E a Warhol Dress for her birthday. 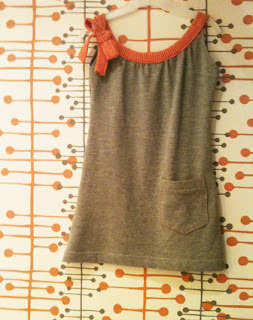 The free tutorial on the made website was so easy to follow and the whole dress was finished within two hours. Not bad for a first attempt! 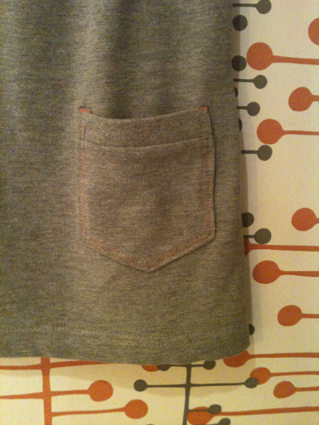 I made it using a grey polo shirt from Primark (the pocket is made from one of the sleeves) and some super-soft orange fabric for the neck. Here it is, just before it got wrapped! As well as a picnic, donkey rides, a tattoo parlour, swimming, ice cream, and birthday cake there was a fancy dress parade. I am not afraid to admit that I got very excited by this and spent quite some time planning Wiss's outfit - handmade of course! 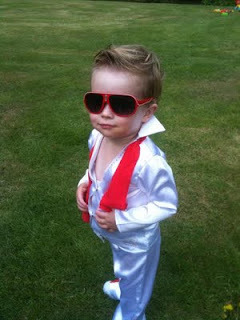 We decided that a mini Elvis would be pretty cool and so I got sewing a version of the famous white jumpsuit. I thought that trousers and a top would be more practical than a jumpsuit for an 18 month old, so I made the flares using Dana's kid pants tutorial with an insert to make them 'flare'. I made my own pattern for the shirt based on one of Wiss's t-shirts. It wasn't perfect but it was good enough (the straining poppers only added to the authenticity!) A simple red jersey scarf, some sunglasses and some fabric paint for jewels were the finishing touch. Elvis has now left the building, thank you and good night!